So who’s excited for Thrillerfest this year? On Friday, Megan Abbott will be interviewed by Lee Child, and George R.R. Martin will be interviewed by Anne Groell. Saturday, James Rollins will be given the Silver Bullet award and interviewed by Steve Berry. It’s also the chance to see past ThrillerMasters, including Lee Child, GRRM, David Morell, and R.L. Stine. This is the “biz” convention unlike “fan” conventions, such as Bouchercon. And as such, it’s the time to ask all the questions you may have about the craft and the business. 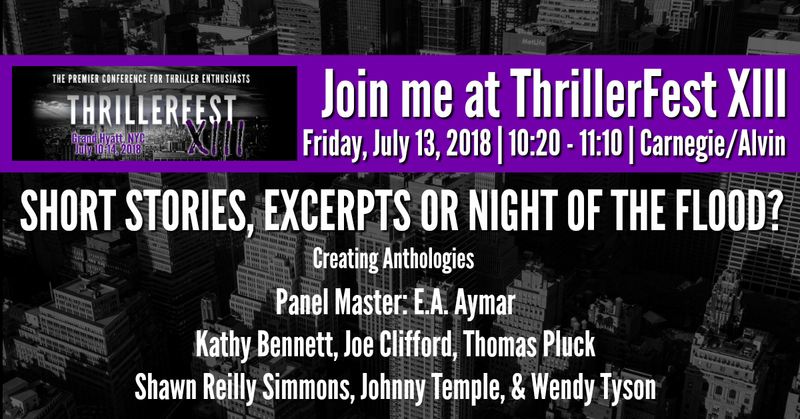 I will be on a panel Friday morning, hosted by Ed Aymar, about editing anthologies, with Joe Clifford, Kathy Bennett, Shawn Reilly Simmons, Johnny Temple, and Wendy Tyson. It should be a good time, if you’ve ever had any questions about editing one yourself. It’s not as easy as you think, and the term “thankless” gets thrown around. So, hope to see you there Friday!